Filipinos have to be more careful when it comes to their lifestyle choices. According to the Department of Health, heart illnesses and other non-communicable diseases are among the leading causes of death among Filipinos. Unfortunately, all of the top causes of death in the Philippines are related to poor lifestyle choices and sedentary living. What is the real cost of living an unhealthy lifestyle in the Philippines, and what is the financial and personal impact of these choices in our lives? According the group, more and more people are moving to the city because of convenience and accessibility, with proximity to the country’s biggest working districts as probably the biggest takeaway. While urbanization opens new opportunities for the people, it also contributes greatly to factors such as pollution, which plays a big factor when it comes to several diseases. With the influx of high-paying industries in the country such as the business process outsourcing industry, Filipinos now have more purchasing power than before. However, people tend to spend their money on unhealthy products instead of building up their health. The food industry in the country is on a roll over the past few years, with more restaurants starting to compete with dominating brands in the country. However, fast food is still the main go-to places among Filipinos when it comes to choosing what to eat. Furthermore, there still are a few cheap but healthy restaurants in the country. 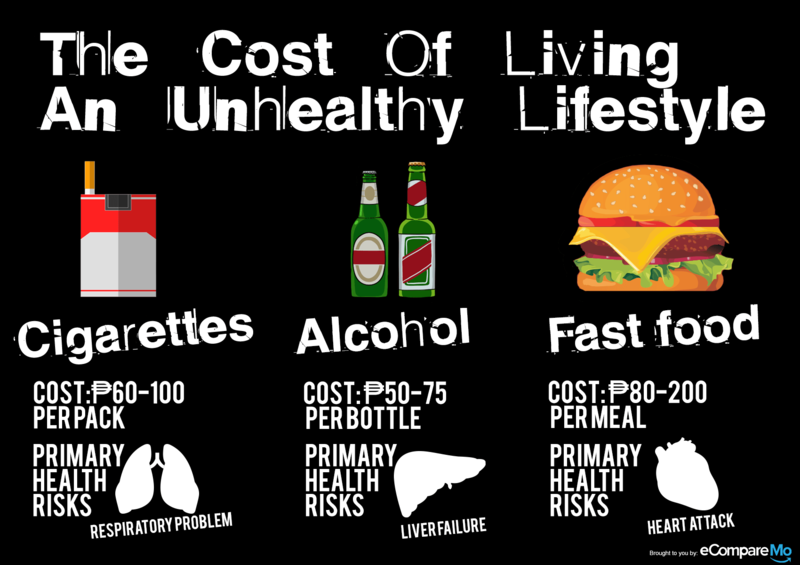 So what is the real cost of unhealthy lifestyle? The said factors playing a huge part in our lifestyle choices, and our unhealthy choices greatly debilitate our overall well-being. However, little do people know that simple lifestyle choices can also affect your financial standing, and more often than not, they affect our monthly budget for the worse. What is the cost of living an unhealthy lifestyle, and what are their consequences? Needless to say, cigarette smoking is dangerous to your health. While a lot of people know about the health risks involved with cigarettes, a lot of people do not know what chemicals make smoking really bad. Among the most common chemicals found in cigarettes are nicotine, tar, and carbon monoxide, as well as formaldehyde, ammonia, hydrogen cyanide, arsenic, and DDT; all which are harmful to the body. If the potential health risks won’t make you stop, then think about smoking one pack a day costs you around 1,800 Pesos per month! While advertisements of alcoholic beverages never fail to remind us to only drink moderately, we often disregard this and drink until the wee hours of the morning. While occasional drinking is okay, as long as there’s no occasion everyday, chronic alcohol drinking can cause serious health problems, especially liver-related diseases. Cirrhosis, liver cancer, and other renal problems are the biggest health risks posed by regular alcohol consumption. Fast food is enjoyable every now and then, but eating burgers, fries, and other fast food items regularly can put your health at risk—not to mention that it will add some serious dent in your budget. Aside from the risks of going overweight due to these food items overloading with calories, they can also cause serious cardiovascular problems such as heart attack and stroke. Pair fast food eating with sedentary lifestyle and you’re definitely in for a killer combo, quite literally this time. Let’s face it: unhealthy lifestyle doesn’t only entail serious health problems, but they can also cost you a lot, especially when you also factor in hospitalization, treatment, and other factors. There is no winning side in living a very unhealthy life, and you might as well just change your ways for the better before it’s too late.